In the seventh pAsuram, AzhwAr says “While I have not pursued any means to attain you, I cannot sustain even for a moment without experiencing your enjoyability”. Seventh pAsuram. emperumAn says “You have acquired this knowledge to say ‘meynnAneydhi‘; that will certainly lead to the result; why not you be patient then?”, AzhwAr responds “Your enjoyability does not let me wait patiently; I cannot sustain without you”. adiyEn mEvi amarginRa amudhE! imaiyOr adhipadhiyE! kodiyA adu puL udaiyAnE! kOlak kani vAyp perumAnE! sediyA vinaigaL thIr marundhE! thiruvEngadaththemperumAnE! nodiyAr pozhudhum una pAdham kANa nOlAdhARREnE. perumAnE – oh one who accepted as servitor! emperumAn is eternally enjoyable for me to approach and experience him; he is having the supremacy to control the nithyasUris; he is having garudAzhwAn who eliminates the enemies of devotees, as his flag; he is having beautiful lips which are like reddish ripened fruit with beauty etc which increase such enjoyability and is having greatness of such unlimited enjoyability; oh one who is residing on thirumalA, being the best medicine to eliminate the dense bush like sins of mine, and who accepted me as your servitor! While I have not put in any effort to see your divine feet, I cannot bear even a fraction of a moment [without seeing them]. adiyEn mEvi amarginRa amudhE – This [nectar] is unlike the salt water of dhEvas; and it is not enjoyed in groups collectively [it is enjoyed by me]; this is the nectar which is enjoyed by the exclusive devotees of emperumAn! imaiyOr adhipadhiyE – There is a group waiting to accompany while enjoying this nectar there [in paramapadham]. kodiyA adu puL udaiyAnE – Oh one who is having periya thiruvadi who has eliminating the enemies as a natural quality, as your flag! kOlak kani vAyp perumAnE – Oh one who mesmerized and captured me by showing the reddish complexion of your beautiful, ripened lips! AzhwAr was captured by his lips [or just the physical beauty]. It appears that emperumAn has hoisted the garuda flag to let his devotees enjoy his beauty. sedi Ar vinaigaL thIr marundhE – sedi – sin; Oh one who is the medicine to remove the sorrows caused by vices which are filled with sins! Eliminating the hurdles to let one enjoy his beauty. Alternative explanation – Oh one who is the medicine for the karma (vices) which are dense and deep! The nectar itself is the medicine. There is no medicine other than him as said in mUnRAm thiruvandhAdhi 4 “marundhum poruLum amudhamum thAnE” (He (his divine feet) is the medicine, wealth and nectar) and in thiruvAimozhi 9.3.4 “marundhE nangaL bOga magizhchchikku” (He is the medicine for our enjoyment); he is as said in periyAzhwAr thirumozhi 5.3.6 as “maruththuvanAy ninRa mAmaNivaNNan” (The great maNivaNNan, who is a doctor). 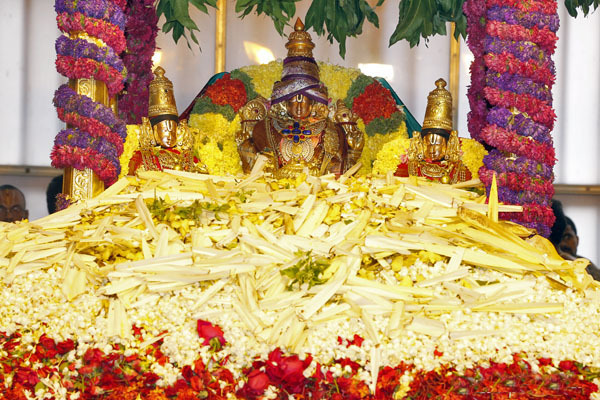 thiruvEngadaththu emperumAnE – For those who consume that nectar, it is like a medicine from the mountain. For those who consume that nectar, it remains like a jar (from which water is poured from the top) which is nicely placed on a high position. AzhwAr is saying “Being the lord of nithyasUris, having garuda as his flag, being the medicine for deep/dense sins, being the lord of thirumalA, being the one with reddish, beautiful, ripened lips – Oh the nectar who is approached and enjoyed by me!”. When bhattar was asked “in [emperumAnAr‘s] nithya grantham [a grantham describing the home thiruvArAdhanam process], when it says ‘while offering food to emperumAn, recite these sthOthrams (verses in praise), which pAsurams/SlOkams are indicated there?”, he mercifully explains “Recite pAsurams such as ‘adiyEn mEvi amarginRa amudhE‘, thirumAlai 2 ‘pachchai mA malai pOl mEni‘ etc”. nodi Ar pozhudhum – Even the moment which can be filled with a second. una pAdham kANa nOlAdhu ARREnE – While I have not pursued any means to see your divine feet, I cannot bear even for a moment [not seeing them]. I am in anguish as if I have pursued the means and am waiting for the result. AzhwAr is in agony due to not having any means on his own [such as karma, gyAna, bhakthi yOgas]. For a person who pursued other means [than emperumAn himself], he can remain patient thinking “Once I complete the process, I will get the result” or “Due to the shortcomings in the pursuit, the result is being delayed”; but for AzhwAr who considers emperumAn only as the means, when the result is delayed, he becomes frightened thinking “Am I so unfortunate that even his mercy is not flowing on me successfully!”. This entry was posted in thiruvAimozhi, thiruvAimozhi 6th centum on June 21, 2018 by Sarathy Thothathri.